This is why the return of core sets excites me. Sets like conspiracy and battlebond show the power and value of reprints that wizards can afford to place in normal-priced packs with large print runs. Core sets create a chance to get some of that value on a more regular basis. 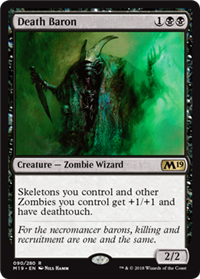 ...as long as those cards are appropriate for standard... and wouldn't hurt modern... and have text simplistic enough for a core set... seems limiting but still allows for things like fetch lands, death's shadow, or thoughtsieze in the future.